Just installed the latest beta update and I get an annoying system beep for every single CDLC and just as annoying a msg stating that the CDLC is missing come important part. These CDLCs are all functional and missing nothing. I stopped the process when it took 5 minutes to scan 20 files...with over 1600 songs I'd be waiting until May for it to complete it's initial erroneous scan. I'll try to attach a bmp. plz pm a copy of any buggy cdlc. 38 special LaceyB will do since it is no longer available. 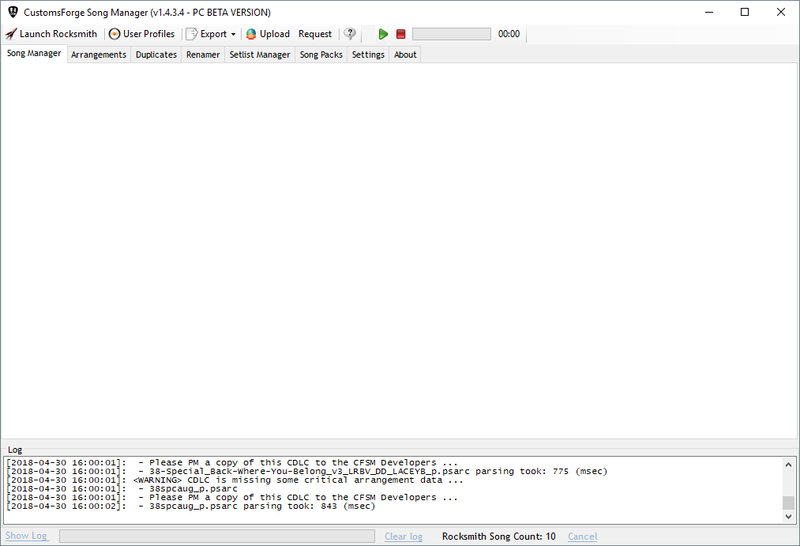 There is a good chance that these CDLC are missing the sortable album name or song volume information because they were produced with older version of toolkit. This <Warning> is not a bug but an actual condition. I will check the CDLC once you PM them and then possibly easy up on the error checking if this is determined to be the case. Plz try latest beta version of CFSM. It also fixes the dll issues. Annoying system beep gone, thank you. Is there a logfile created showing the warnings so that I can check for updated files? Obviously I'll ignore the erroneous warning for the built-in game files (as stated above) but if I can get updated CDLCs for the others, I will.